*Offer valid on purchases made between 1 February 2019 and 30 April 2019. Subject to approved installment credit with John Deere Financial. Package payment based on 20% down and 0% APR for 72 months. Taxes could increase the monthly payment. Photo for illustrative purposes only, actual equipment may vary. Price and model availability vary by dealer. Some restrictions apply. See dealer for details. †Manufacturer's estimate of power (ISO) per 97/68/EC. 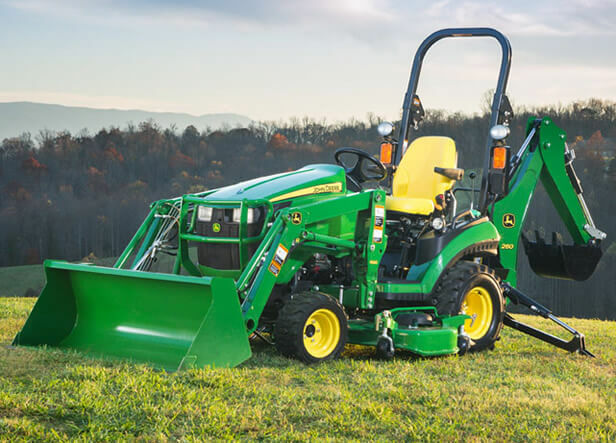 **All Compact Utility Tractors purchased new from an authorized John Deere Dealer come standard with a 6 year/2000 hour (whichever comes first) Power-train Warranty. See the Limited Warranty for New John Deere Turf & Utility Equipment at dealer for details.